The arrest of Yukos CEO Mikhail Khodorkovsky on October 25 interrupted a dramatic and long-running bull market for Russian stocks. Before news of the arrest broke, the benchmark RTS Index had shown remarkable momentum, rising some 65 percent year to date, bolstered recently by the upgrade of Russia’s debt to investment grade. The index had risen by more than 1,100 percent since the financial crisis in 1998. This rally gave rise to the usual mix of euphoric and cautionary comments as analysts relished the gains but also hedged their bets, advising investors to guard against the impact of profit-taking. On balance, though, investors expected that the Russian market would continue to deliver strong performance, at least over the next year. In an earlier LJ Consultants survey – completed a few weeks before Khodorkovsky’s arrest – sixty percent of the respondents said they expect the RTS to deliver above-average performance over the next year, compared to other emerging markets. Nine percent expected the index to rank as one of the best emerging markets. Investors were particularly heartened by the strength of Russia’s economic recovery, positive trends in the oil market and the long-term prospects of wireless, metals, oil and gas industries. 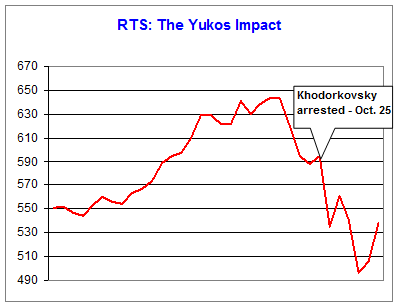 In the days since Khodorkovsky’s arrest, the RTS has declined as much as 16 percent. The phrase “capital flight” re-emerged in news headlines. And speculation about other crackdowns on Russia’s business elite took on a heightened sense of urgency. A new set of questions now dominates Russia’s capital markets: Was Khodorkovsky’s arrest the work of an independent prosecutor, as the Putin administration has claimed? Or was it, as Khodorkovsky sees it, a heavy-handed political maneuver designed to silence Kremlin’s opposition? Is the Yukos investigation an isolated case, as Putin has assured investors, or is it a mere prelude to a wholesale review of Russia’s Yeltsin-era privatizations, as many investors still fear? If the investors are right, which companies would be the likeliest targets of any future investigations? And more generally, should investors re-interpret Russia’s bull market – through the prism of the Yukos controversy – as a happy march to a bleak end? Or should they relegate the recent events to the margins of Russia’s evolving investment thesis? These are some of the questions we tackled in this study, based on responses from 72 members of the international investment community. Sixty-eight percent of the respondents were institutional investors (Buyside); they collectively represent 17.6 percent of total institutional investments in Russia. The rest were analysts at leading Western and Russian brokerage and independent research firms. The responses were compiled – through an online survey and phone interviews – between October 29 and November 3, 2003. The arrest was politically motivated. Khodorkovsky has maintained that his arrest, as well as the larger crackdown on Yukos, was a political maneuver designed to weaken the opposition to the Putin administration. This claim has resonated with investors and analysts much more convincingly than Putin’s repeated denials. Eighty-one percent of the respondents believe that Khodorkovsky’s arrest was politically motivated. Only five percent believe that it was not. Importantly, European respondents were more likely to echo Khodorkovsky’s view on this question (85 percent) than U.S.-based respondents (65 percent). Similarly, 84 percent of the buy-side respondents believe the arrest was politically driven, compared with 69 percent for the sell-side respondents. The arrest was bad for the market. 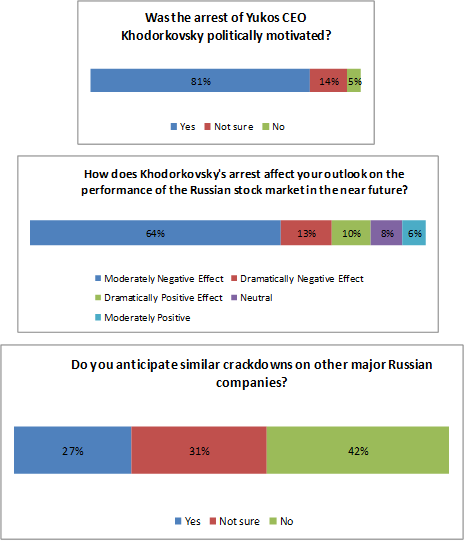 The majority of respondents anticipated a moderately negative market reaction to the Yukos controversy in the short-term. Sixty-four percent of the respondents said the controversy has had a moderately negative short-term effect on their outlook on the performance of the RTS. Another 13 percent reported a dramatically negative shift in their market outlook. Perhaps surprisingly, 16 percent of the respondents reported a moderately or dramatically positive shift in their expectations for the Russian stock market; disproportionately, these were US-based respondents. Sell-side outlook on the RTS seems to have drifted southward more than buy-side sentiments (81 percent vs. 72 percent). There is little consensus on the likelihood of similar crackdowns on other major Russian companies. Forty-two percent of the respondents said they do not anticipate more crackdowns; 27 percent said they do. Thirty-one percent were not sure. Only 12 percent of sell-side respondents anticipate further crackdowns, compared with 36 percent for the buy-side. According to several respondents, the likeliest targets of future investigations are privatized state assets and companies without significant government representation. Among companies specifically mentioned as possible targets were: RusAl, AvtoVaz, Sibneft (guilt by association with Yukos), Norilsk, Lukoil and Surgut. One respondent said “practically everything in the Energy sector apart from Gazprom and Transneft” could be a target. Previous Russia: Up or Down? Investors Speak!